Wouldn’t it be great to have the dependability of Excel anywhere and anytime? 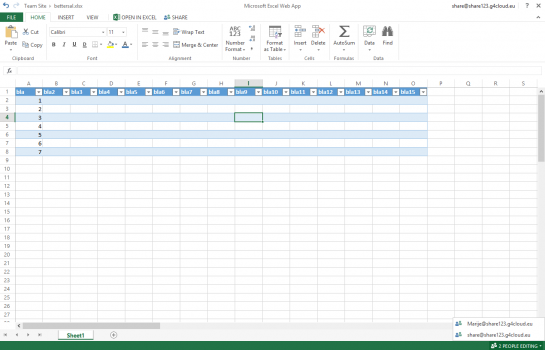 The Excel Web App is an online version of Microsoft Excel that extends the Office experience you’re already familiar with to the Web. Enabling its users to interact with Excel workbooks directly in their web browser, without having to have the Excel client installed on your computer. The online version comes bundled with Word Web App, PowerPoint Web App and OneNote Web App as part of our SharePoint 2013 offering. Microsoft Excel 2013 looks different from previous versions. To minimize the learning curve, check out this guide. Can I order OneNote Web App as a separate service? No, Microsoft OneNote is part of the Microsoft Office Web Apps bundle. The bundle is only available as part of the SharePoint 2013 product. Can I order Word Web App as a separate service? No, the Microsoft Word Web App is part of the Microsoft Office Web Apps bundle. The Web Apps are only available as part of the SharePoint 2013 product. Can I order Excel Web App as a separate service? No, Microsoft Excel is part of the Microsoft Office Web Apps bundle. The bundle is only available as part of the SharePoint 2013 product. Can I order PowerPoint Web App as a separate service? No, the Microsoft PowerPoint Web App is part of the Microsoft Office Web Apps bundle. The Web Apps are only available as part of the SharePoint 2013 product.